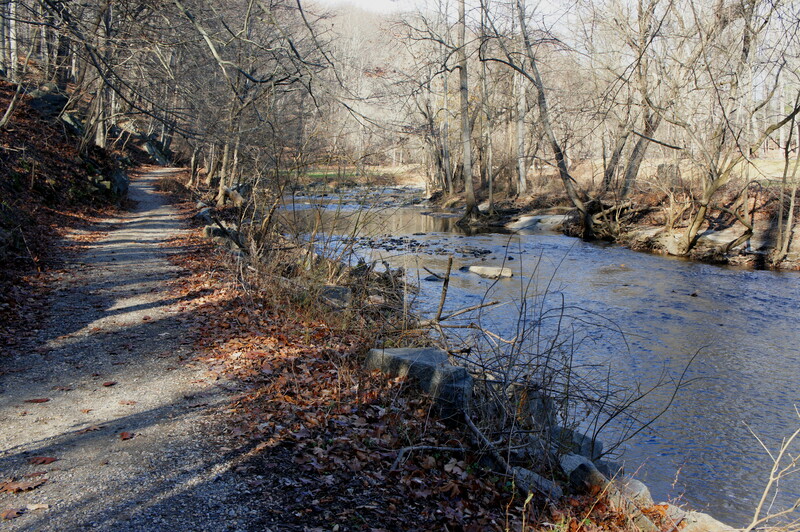 While it is possible to park at Milkhouse Ford, Rock Creek Park’s official “half-day hikes” brochure directs hikers to start at the popular Nature Center, a good launching point for first-time visitors to Rock Creek Park. From the parking area at the Nature Center, bear straight on the paved path heading north, then stay left at the start of the short, wheelchair-accessible Edge of the Woods Trail. Steps later, you will encounter a four-way junction; stay straight on the paved route, which has now merged with the lengthy Western Ridge Trail. 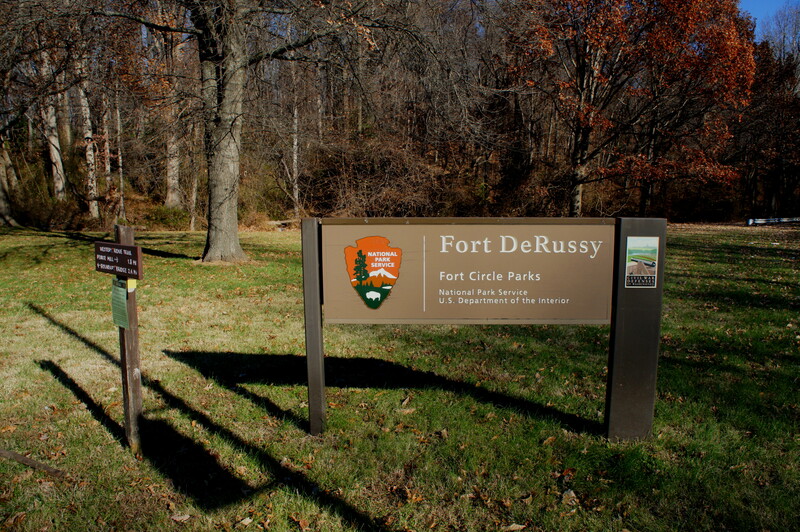 Bearing downhill, you will meet the buzzing Military Road at 1/10 mile; use the crosswalk to reach the other side, where the pavement continues past a large sign, which indicates that you are entering the Fort DeRussy section of Rock Creek Park. Continue straight as the path climbs into the woods, approaching another junction. Here an interpretive sign directs hikers to take a right toward the fort. About 100 feet later, take a left, leaving the asphalted path for a well-trodden dirt track. 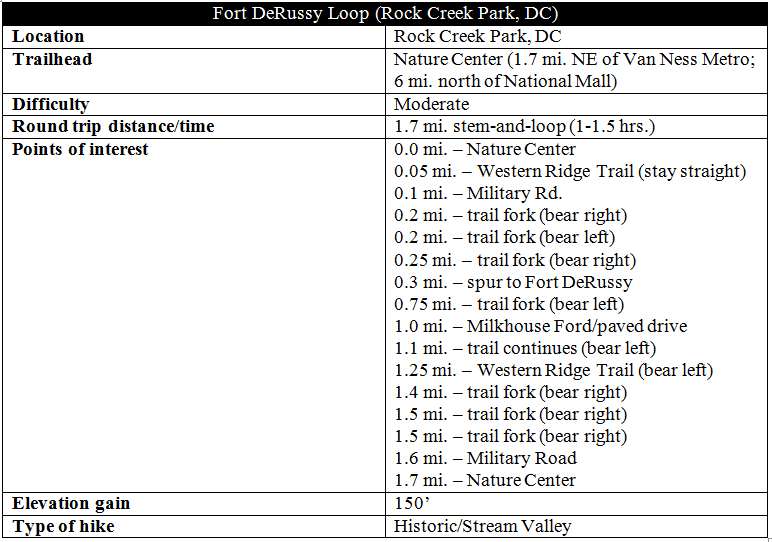 Bear right again at the next fork, gradually gaining elevation and reaching Fort DeRussy (on the left) within minutes. 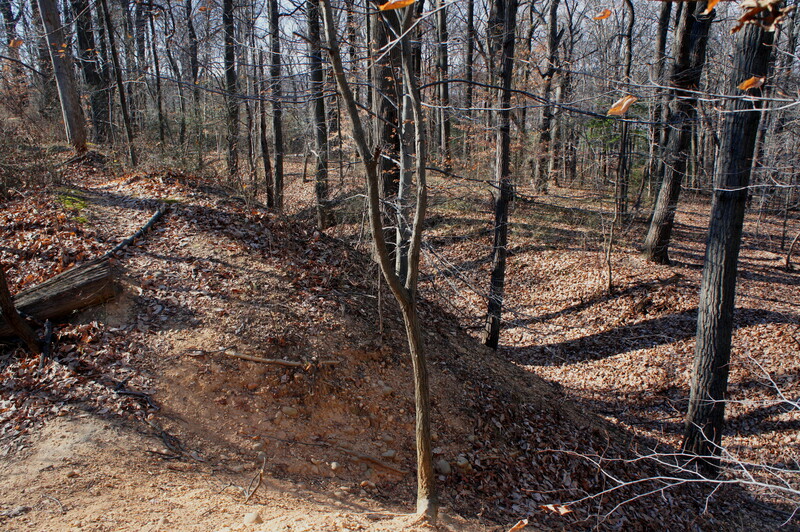 Here a wayside tells the story of the fort and its mighty cannons, and a spur trail leads up into the earthworks. Follow the path to the low pass between two man-made mounds, then walk the perimeter of the trapezoidal fort to check out all vantage points. Today the fortifications are shrouded by tree cover, thanks to the preservation of Rock Creek Park since 1890, obscuring the vistas once enjoyed by the Union battery at Fort DeRussy. But the fort is remarkably well-kept, with well-defined infantry trenches and visible remains of where powder magazines were once kept. Returning to the main trail, take a left and continue around the remainder of the loop. 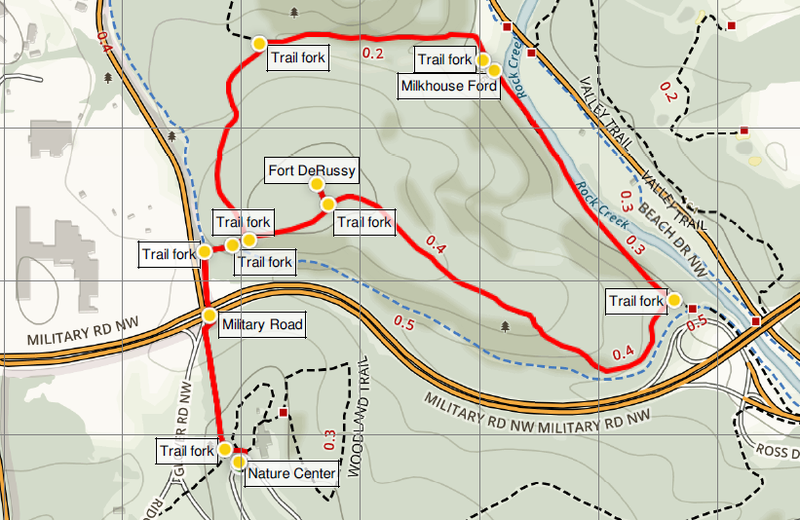 Amid chestnuts, oaks, tulips, and beech trees, the Fort DeRussy Trail gradually descends a woody ridge, then drops sharply at about 6/10 mile to within striking distance of Military Road again. 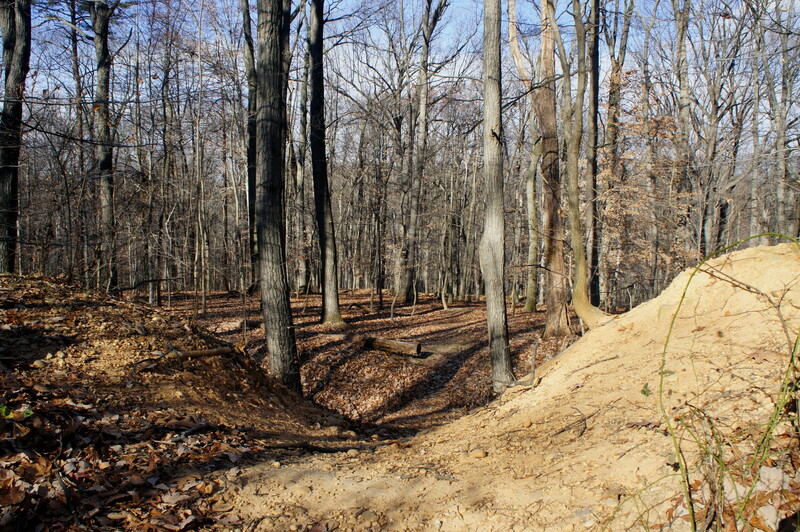 After briefly paralleling a paved path (below on the right), the trail forks at ¾ mile. Bear left and continue northwest as the trail descends to meet the banks of Rock Creek at 9/10 mile. Across the creek, look for a modest log cabin once owned by the quirky, 19th century poet Joaquin Miller. 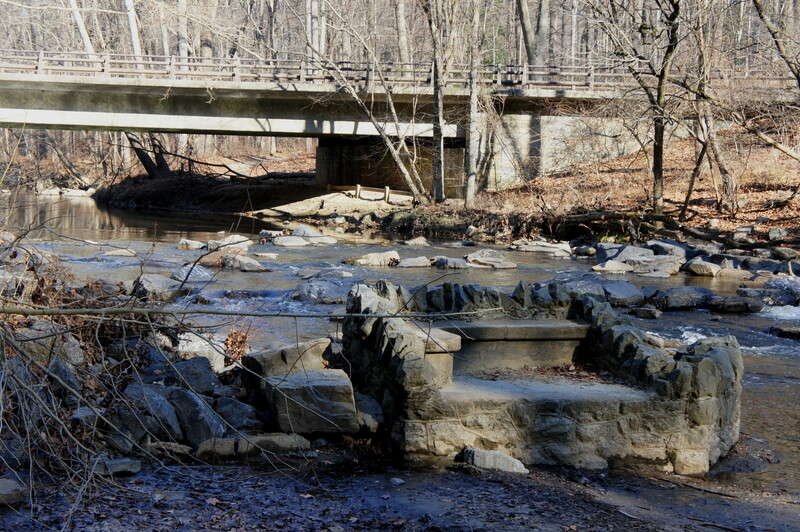 At the one-mile mark, the remains of a stone structure, on the banks of Rock Creek, are visible on the right; this is Milkhouse Ford, where concrete was laid in 1904 to provide passage for across the wide creekbed. Behind it is the much-less-quaint, modern-day Milkhouse Ford Bridge. Shortly after the ford, the northbound trail temporarily ends at a graveled parking lot. Walk up the road for 15-20 yards, then take a left on a fresh path heading west up a deep gully with a small stream. 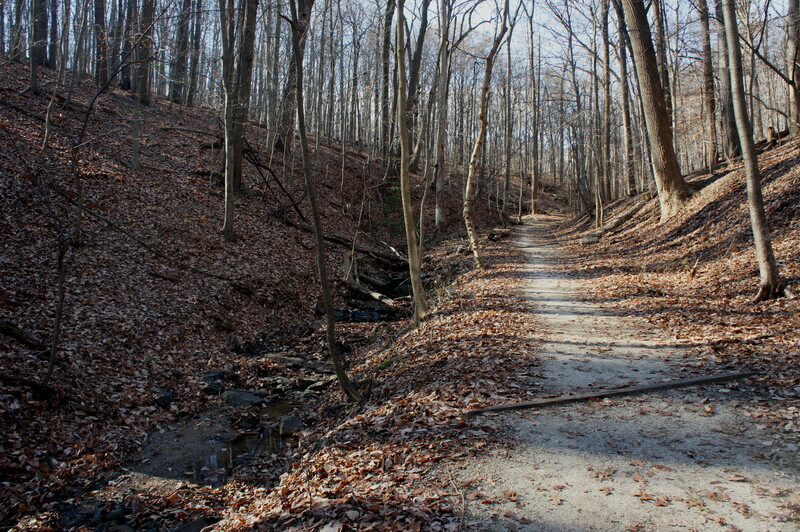 With high slopes on either side, cross the minor creek at 1.15 miles, then bear left at the trail fork 150 yards later. 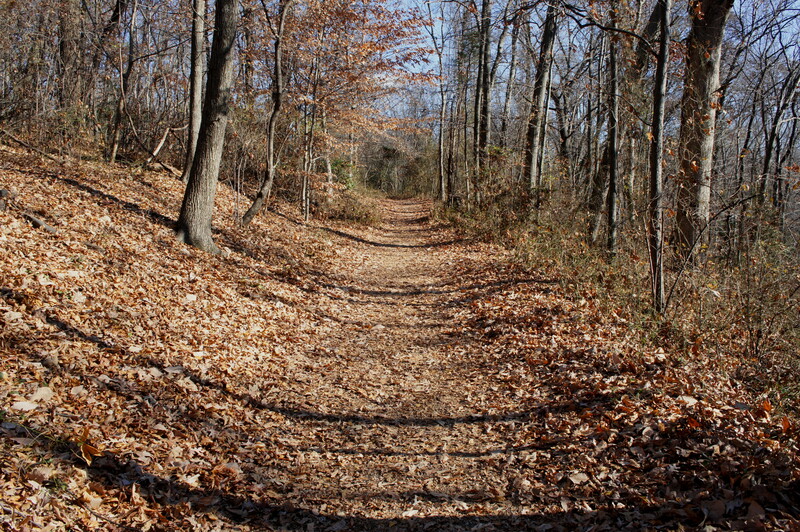 Now you are back on the Western Ridge Trail, which you will follow all the way back to the Nature Center. From here the trail skirts the west flank of the hillside on which Fort DeRussy sits, with views across Oregon Avenue toward St. John’s College High School. After cresting a low ridge, the path drops to meet the Fort DeRussy Trail. Take a right and continue downhill to meet the paved path again; you are now retracing your steps from early in the hike. Bear right, and then turn left toward Military Road. 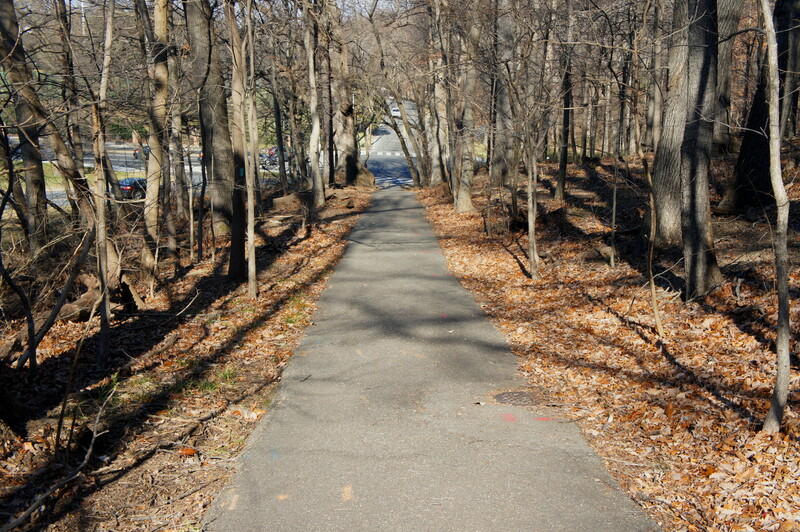 After crossing the road, you are in the final stretch: a steady uphill back to the Nature Center and original parking area. Expect to take at least 45 minutes to an hour for this hike; Civil War “buffs” may want to allot more time. 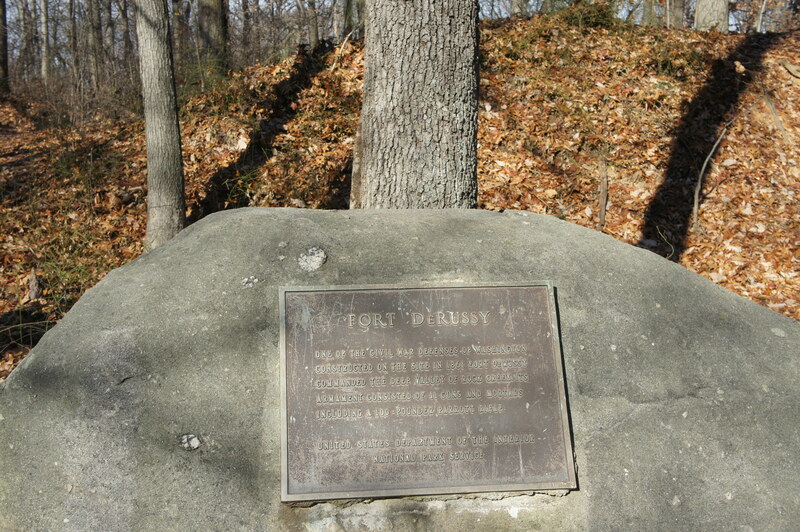 This entry was posted in Civil War, District of Columbia, Moderate Hikes, Rock Creek Park and tagged Civil War, Civil War Defenses of Washington, Fort DeRussy, historic, loop hike, Military Road, Milkhouse Ford, Milkhouse Ford Loop, Rock Creek, Rock Creek Park, Rock Creek Trail, stream valley, Washington DC, Western Ridge Trail. Bookmark the permalink.